Do you have dark days that zap your strength and leave you feeling weak? An inspirational Bible verse for strength is needed in those times. Actually it is needed before those days come... because the truth is, it is not a matter of if those day will come, but when. So have some encouraging scriptures ready to lift you up. Memorize as many as you can. 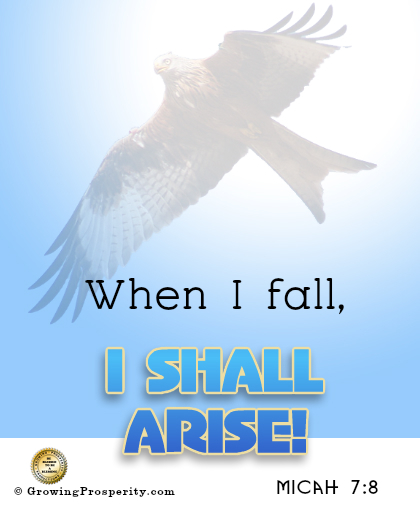 Know that when you fall - you shall arise. The Lord shall be your light and bring you strength. "The LORD shall be a light unto me." So believe it and stand on it. "Rejoice not against me, O mine enemy: when I fall, I shall arise; when I sit in darkness, the Lord shall be a light unto me." LIKE, TWEET, SHARE & COMMENT - We Love to Hear from You! Related Post "Inspirational Bible Verse Strength – The Lord Shall Be My Light"